With the U.S. oil industry hitting a lull from too few pipelines, this short-term issue could be a great time to buy U.S. Silica's stock. The writing has been on the wall for a couple months that the second half of 2018 was going to be a challenge for U.S. Silica Holdings (NYSE:SLCA). The North American oil and gas industry has slowed down considerably in recent weeks, and that means less sand demand. That said, this most recent quarter was much worse than most expected because of weak prices and one-time charges. As bad as this was, though, there is still reason to believe that this stock could be a good investment selling on the cheap. So let's take a look at what happened and why investors may want to forgive this less-than-stellar quarter. DATA SOURCE: U.S. SILICA EARNINGS RELEASE. EPS = EARNINGS PER SHARE. So here are the few slivers of good news in U.S. Silica's report. One is that sand volume sales were up 10% sequentially, so it's not as though sand demand has completely collapsed. Also, the company continues to see great performance from its nonfrack sand business segment. The industrial and specialty chemical business was a consistent performer that also helped the overall business through the last downturn. With the recent acquisition of EP Minerals, this part of the business is posting record results for sales volumes, revenues, and per-ton margins. There were two things that absolutely killed the company's earnings this past quarter: overall sand prices and one-time expenses related to capacity expansion and acquisitions. Per-ton contribution margins for its oil and gas proppant business declined from $33.07 per ton in the second quarter to $23.43 per ton. Even though U.S. Silica signed several supply contracts for its newest mines in the Permian Basin, most of its Northern White sand produced in the upper Midwest is still sold on the spot market. Data source: U.S. Silica Holdings. Chart by author. Management also noted that there were considerable one-time costs this past quarter that impacted earnings. There were about $35.2 million in expenses related to expanding capacity at existing facilities, the acquisition of EP Minerals, and some integration costs. If we were to strip out these costs, earnings would have been more in line with what we saw this time last year. According to CEO Bryan Shinn, the rest of 2018 could be pretty tough for the company, as infrastructure constraints have caused many oil and gas producers to delay completing several wells until pipeline capacity opens up. As those issues clear up, though, he anticipates much better results in 2019. I am positive on the outlook for our Oil and Gas businesses in 2019. While we will likely see more white space on our customers' calendars for the rest of this year, we believe these near-term challenges are transitory. Budgets will reset in 2019, takeaway capacity will be expanded and the record inventory of DUCs will begin to be completed. All of which should provide positive catalysts for sand and logistics demand. Further, we expect to see more higher cost Northern White sand capacity idled in the next few quarters, which will help balance supply and demand and support stable pricing. For reference here, DUC is a drilled, uncompleted well. These are the wells that producers have suspended from completing the fracking process, and an inventory of these wells is more or less a backlog of work for oil services companies. 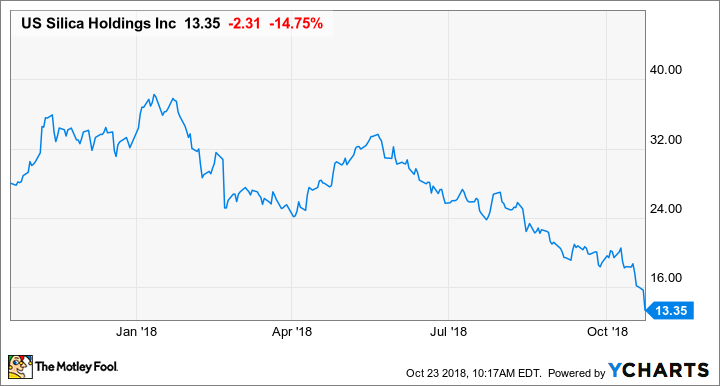 I think the largest criticism you could level against U.S. Silica right now is that management was a bit overoptimistic at the end of last quarter. Sure, it did deliver volume growth as promised, but pipeline capacity constraints have been an issue for months, and management should have known they would impact completion of wells and, ultimately, sand prices. That said, the issues that are impacting U.S. Silica's results today are transitory. As pipeline capacity gets built out, producers will turn the taps back on, and all of those wells waiting to be completed will get fracked. As that happens, sand prices should pick back up again. That, combined with U.S. Silica's addition production capacity and its Steady-Eddie Specialty products business, should lead to much higher earnings. The one concern, of course, is the company's elevated debt level because of its recent purchase of EP Minerals. Getting that debt level down should be a cash flow priority right now. Summing it all up, this stock still looks attractive. We're probably going to see another quarter or two of tough comps because of those pipeline constraints, but it gives investors a long window to build a position in this dirt-cheap stock.